PDF for Month 1 of the Spring Wreath Block of the Month. This year's new block of the month pattern starting the end of September 2018. 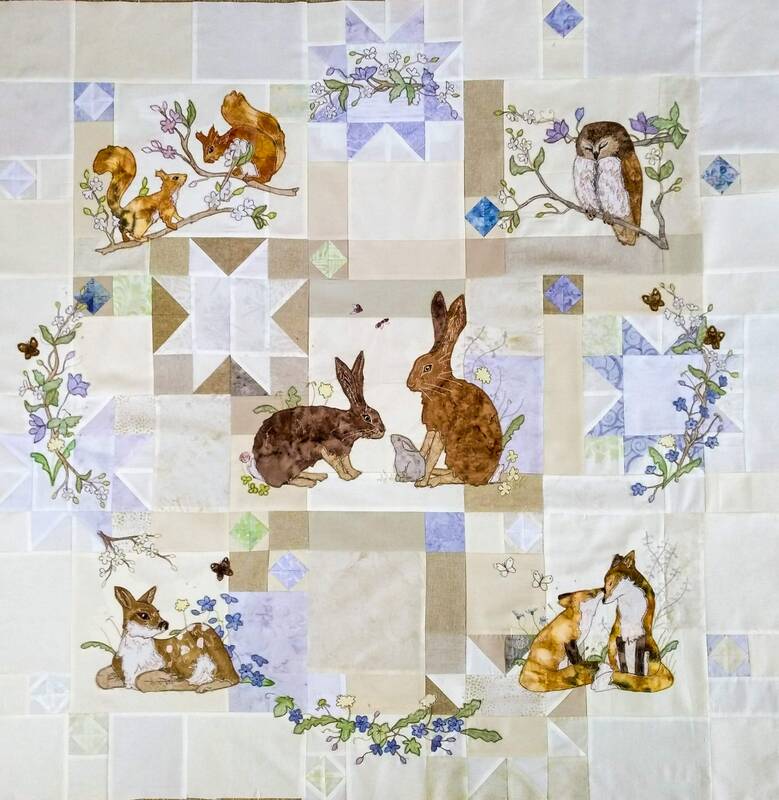 A soft palette of neutrals and lilac complete with woodland animals and wild flowers. 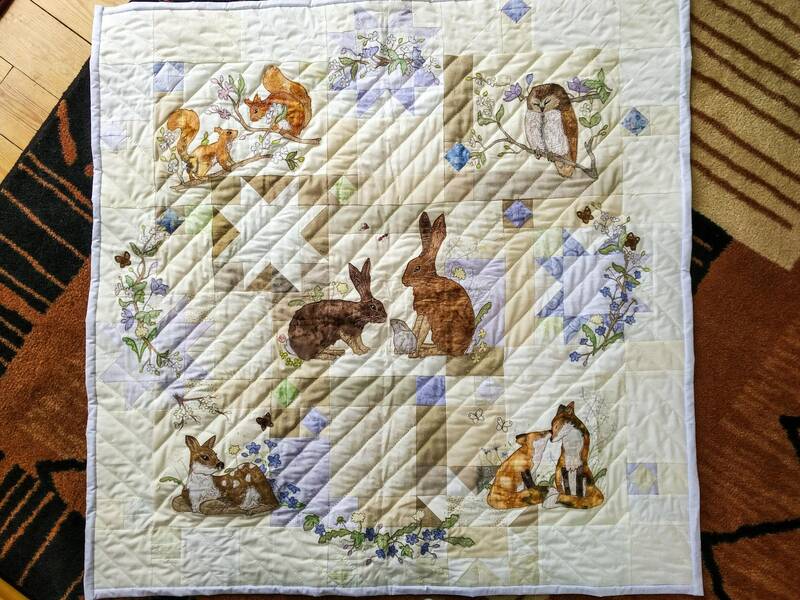 This quilt measures 40 by 40" and would be ideal on the wall or to cuddle up under. This is my second Block of the month quilt and having learnt by my mistakes, I am going to do things a little differently this time! So the quilt will be split into 7 sections, one per month, starting September, but I will be missing out the month of December. December is a busy time in our house with the little ones and I want time to enjoy it, so I won't be sending out an invoice or patterns/kits that month, and will pick up again in January. So it will run September to March with one month off in December. I am also offering only one colour way! However if you would like to make a different coloured background or want to use your own fabrics, then I am offering either the full kit, just the pattern, or the pattern plus applique fabrics as the fabrics for the applique are often the ones people find hardest to source. The quilt itself is in my usual style, so it is a patchwork background with raw edge applique sewn with free motion embroidery. 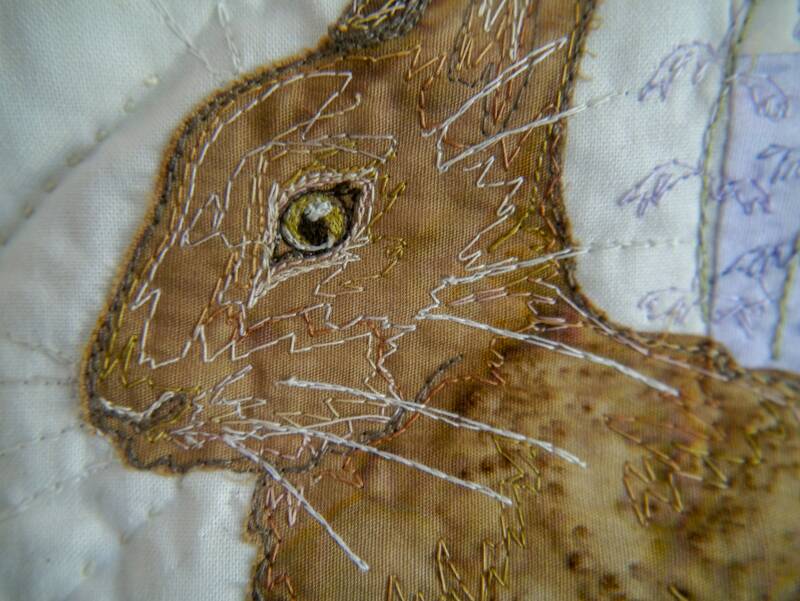 You don't need a fancy machine to sew it but your machine needs to be able to do free motion embroidery. The pattern contains basic instructions for the patchwork. I don't go into a lot of detail on patchwork as I am assuming that you know the basics but other than the odd half square triangle, it is all pretty simple. The kits contain the fabrics, freezer paper and stabilizer you will need to complete the top. You will need to purchase your own threads but I do list every thread that I use so you can use the same if you wish to. The fabrics are supplied as a rectangle/square big enough for the shape you need. No laser cutting so you are relying on freezer paper/pencil and scissors to cut the shapes out yourself. I like this step as it is quite therapeutic. I label all the fabrics with little stickers which tell you what they are to be used for so it makes it a little easier to know which bit goes where. I use raw edge techniques and the patterns are using those instructions, but I will put in sufficient fabric that you could also use needle turn techniques, but no instructions will be given. I am based in the UK and I am happy to ship worldwide. If you are outside the UK then there will be an additional £3 postage charge for either the patterns/kits each month as that is how much extra it costs me.